As one of the wedding photographers in Rockport Massachusetts, I was sad to see this beautiful tree die in the last couple years. The tree provided such a unique look to the Inn and rolling grounds at Emerson Inn by the sea. Located at Hallibut point, Emerson Inn is a historic Inn. It was named after its most celebrated guest, Ralph Waldo Emerson. It has stunning ocean views and is the perfect place for a wedding celebration of just to stop in and have coffee. 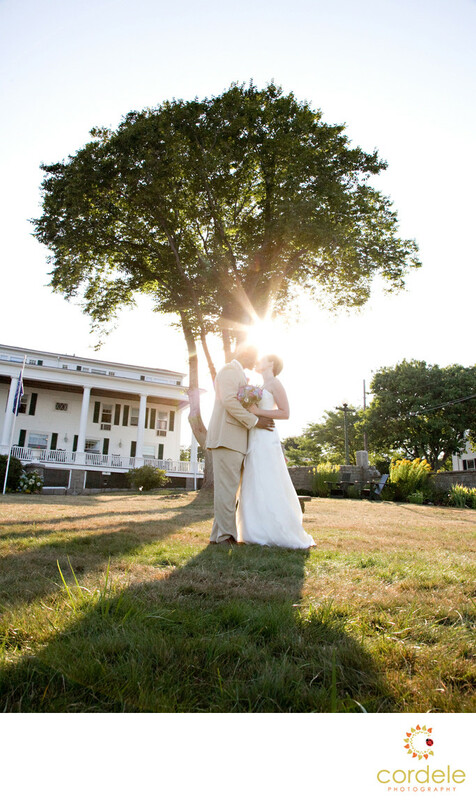 The weddings hosted at Emerson Inn are normally done on the lawn. This resort is home to small intimate affairs and second marriages. Its prefect to have the cozy family wedding you dreamed of on the water. Located in the heart of Pigeon Cove Rockport it's a must see on any coastal tour of New England. Location: 1 Cathedral Ave, Rockport, MA 01966.